Waterloo Station kept expanding from its rather modest beginnings and each time it did so whole streets were swept away. One of the most significant losses during one of these great growth spurts was the church of All Saints on the corner of Lower Marsh and Leake Street (then York Street). This had been built in 1844-5 to cope with the rapidly expanding local population. It attracted some attention at the time of its construction “on the score of novelty” as The Builder magazine put it. “The tower, a slender structure, stands at some little distance eastward from the body of the church, and it is in line with the houses in the New Cut (actually Lower Marsh). It is connected to the church by means of a corridor or cloister. 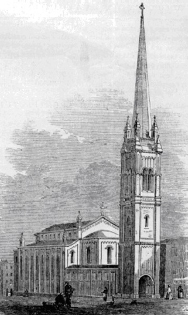 Both the tower and the body of the church are of brick, but the upper storey of the former has stone dressings, small shafts and arches on the face of it, coping, pinnacles, etc, and is surmounted by a stone spire 135 feet high from the ground. The main doorway, too, is of stone. The church consists of a nave and aisles, separated by a range of lofty cast-iron columns of small diameter on each side, which carry semi-circular arches adorned with the “open-heart” and billet mouldings, executed in Martin’s cement. There are galleries all around the church supported on cast-iron girders, rather cleverly arranged at the east end, there is a semi-circular absis with a lofty semi-circular arcade against the all, corresponding with the main arches. The Ecclesiologist magazine did indeed cavil at it and labelled it contemptible. And The Builder magazine’s enthusiasm had evaporated by 1867 when it described it as the gloomiest church in all London. It does not even appear to have been very well built since the tower was declared unsafe and taken down in 1878. The chancel was refitted in the late 1860s by R.J. Withers and an impressive marble reredos was installed which was described as the finest in South London. When the church was demolished in 1899, this reredos was moved to the York Chapel in nearby York Road but did it move again when its second home came to be swept away in the 1950s?Next to All Saints Church a small school had been opened in 1854 but this, of course, was also swallowed by the railway. When the railway company demolished these buildings they built a tall richly moulded brick wall to conceal the exposed flank of the houses in Lower Marsh: this survived until the recent redevelopment of the corner. There are few illustrations of the church – a rather poor engraving of the outside and a faded photograph of the interior. It also features in Percy Cruikshank’s lithograph of the “Cut” (there always seems to have been great confusion between Lower Marsh and the Cut): the church door is prominent on the left so the pub to the right can be identified as the Artichoke (or the Camel and Artichoke in its latest guise) with its archway to Granby Place.